From the age of around 10 years old to now, how has my relationship with makeup evolved? Keep reading to find out. I remember when I was younger, I always liked to watch my mom and grandma get ready and do their makeup. It was so fascinating to see, how they used different products on their face, to enhance their features. I think I was around 10 or 11 years old, when I tried sneaking out the door, going to school, wearing a tiny bit of blue eyeshadow (I know, bold choice!). Didn't sneak out successfully, because my mom noticed right away, but this was my first attempt at wearing makeup. Then I turned 12, and I was now allowed to wear mascara to school. I loved how it enhanced my eyes and made my eyelashes look longer. When I turned 13, I had been adventuring into shimmery eyeshadow from the makeup brand GOSH. Totally got inspired by my mom, who used these eyeshadow regularly. Then my Confirmation came around and I did my own makeup, covering up my acne (as good as I could), applying some blush, some shimmery gold and light green eyeshadow and finishing off with mascara. The picture above on the left side, is from that day. The next two years I pretty much did the same type of makeup, focusing on covering those darn pimples, that just kept on getting worse. 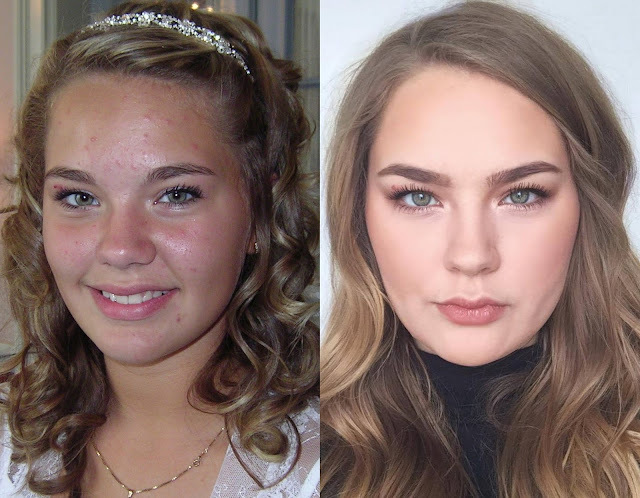 My acne became the main reason why I wore makeup, I was so uncomfortable in my own skin, that I never walked out of the house without makeup on, even if I was just going out in the garden! Then I turned 15 and Youtube came into my life *plays angelic "AHH" choir sound*. This is when the fun really started happening. I watched so many videos on how to apply makeup and create different looks, now I just needed the right tools and makeup. Luckily I won a makeup brush kit, from the local beautician, I had went to, to get acne treatments done and once in a while, I would buy new makeup for my collection. Then I just needed to practice on myself, that meant waking up at around 6AM every morning, to do a smokey eye, before heading to school. I loved it, and remember my friends from school complementing me on it, even though it was a little much for school. I learned better techniques at covering my acne and that made me feel a lot better about myself. Later on in life, I found out people were filling in their eyebrows! After trying it once, I could never do full on makeup, without filling in my eyebrows too, I loved it! 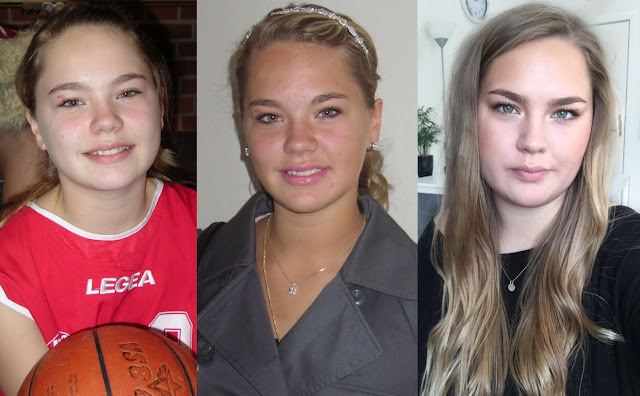 And within the following years, my brows changed a lot, I figured thin brows wasn't the look for me, and grew my eyebrows back, to more of my natural brow shape. Read about my eyebrow evolution here. Besides that, my makeup collection had grown and I had several drawers filled with makeup (can't even imagine how much money I had spend on it!). I kept watching Youtube (still am today) and learning, and that's basically where I am now. I have also done my friends makeup, before going out. I did my best friends, sisters wedding makeup and hair. It has been a fun adventure and I'm still very much enjoying learning new things and tricks. I have become more mindful about not buying tons and tons of makeup, you don't need 20 blushes, a few different colors is just perfect. I want to be able to use all of my makeup in rotation, so I can enjoy every single product.